WATCH FOR THESE NEW PRODUCT RELEASES IN MAJOR MOPAR PUBLICATIONS- YOU CAN EVEN HAVE THEM BEFORE THEY HIT THE NEWS STANDS! The kit obviously costs less than buying a complete transmission of this quality and you will realize substancial savings in shipping costs. 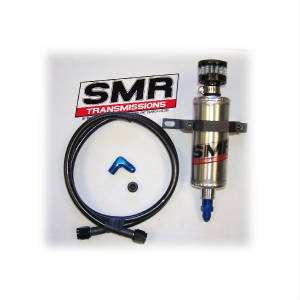 This kit eliminates transmission drips from the vent (located above the neck of the converter, inside the bellhousing), after hard running or decelleration, high temperature or transbrake use. The remote air filter, prevents dust and dirt from entering the transmission in dusty, dirty operating conditions. The remote resevoir holds any fluid emitted during extreme conditions and returns it to the transmission when normal conditions resume. It includes a vent plug for the existing vent, a #4AN 90deg. vent adapter fitting, #4 braided steel line and the aluminum reserve tank with filter. The tank has provisions for roll bar mounting and can also be mounted by 2 screws to a flat surface. Several sanctioning associations require the installation of such a venting system. When increasing the torque load on the 727, the stock cast aluminum 4 pinion carrier with its' stamped splines pose a serious weak link by stripping out on a hard 1-2 shift. 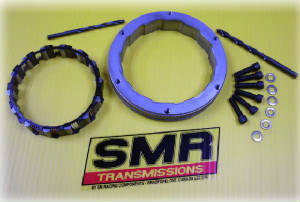 This not only stops your vehicle from being able to drive the rear wheels, it also fills your transmission and even your converter with aluminum particles, requiring a complete rebuild. 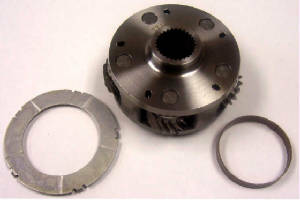 This planetary set replaces the weak aluminum carrier and splines with a much stronger steel carrier and increased load capacity of 5 pinion gears to transfer the torque load. Kit includes the new steel planetary, wide thrust washer and collar bushing. KEEP POSTED -CHECK THIS AREA REGULARILY FOR NEW PRODUCT ANNOUNCEMENTS.